iOS based voice effects application for emulating Star Wars character voices, from stormtroopers to Chewbacca. It is compatible with all iOS devices running iOS 8 or newer! 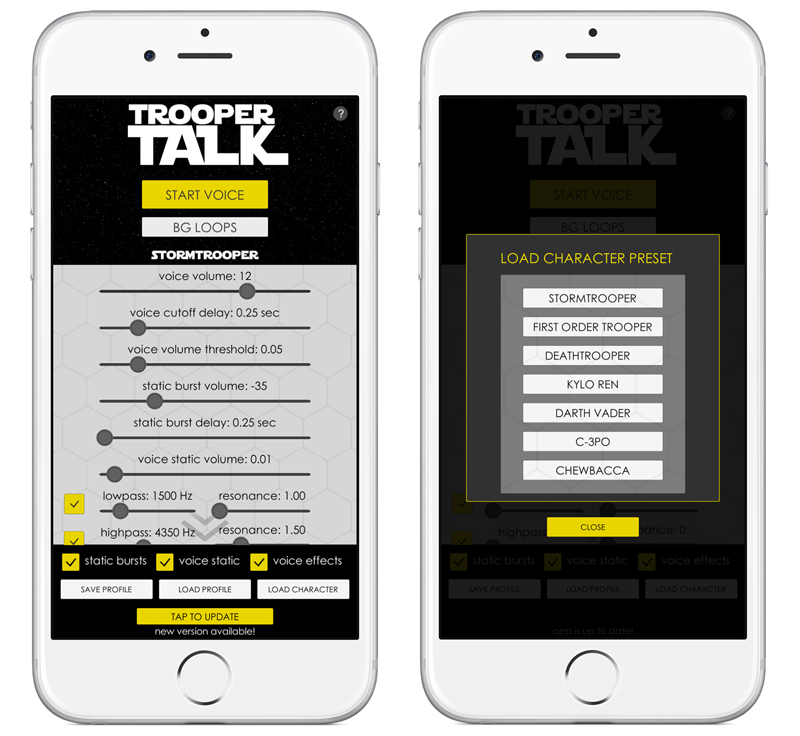 TrooperTalk is designed to be used with an external microphone and speaker. In order to process both mic and speaker signals, a splitter cable is required to convert the single iPhone headphone jack to two 3.5mm jacks, one for mic and the other for your speaker. If you want to (and it is highly recommended) use a mono microphone, such as the Aker mic linked below, you will need the specific splitter linked below, which allows the iOS device to send power to the microphone. A stereo microphone can be used with that splitter as well, you will just get mono audio instead of stereo, not an issue when using the Aker style amp. it is highly recommended that you purchase a 'UNI-DIRECTIONAL' mic if possible. This will reduce the mic picking up unwanted feedback from the speaker at close proximity. The mic provided with Aker amp products is a great option, and is the same one recommended below! NOTE: If you plan to use a splitter other than the one linked below with a mono mic (like the one linked below) you may experience problems or the microphone may not operate correctly. Below are several items which have been tested and are known to have full compatibility with the app. Does TrooperTalk work with bluetooth accessories? While the idea of a bluetooth setup is indeed enticing, latency, or, the amount of time it takes to process and transmit a certain sound through a system, tends to be too large over bluetooth to make something like a voice changer work correctly. On average the latency is about 3x higher than over a wired connection which can lead to a large delay from the time you speak to the emulation being played from the amp, quickly ruining the effect. Will TrooperTalk be available on Android? For now the answer to that is no. Unfortunately due to the massive number of devices that Android runs on, and the varying quality of that hardware, it is impossible to maintain an appropriate level of quality control, especially as it pertains to audio latency. That is, the amount of time it takes to process and transmit a certain sound through a system. I am only one person developing TrooperTalk and keeping up with JUST the iOS devices is hard enough! I have an iPhone 7/8/X, how do I use the recommended splitter? Due to the new iPhone's lack of headphone jack, you'll need to use the supplied Lightning to 3.5mm plug adapter. The splitter and TrooperTalk will then work as expected. Ensure you've started voice processing by pressing the 'Start Voice' button. If so and you still don't hear anything, make sure the plugs are in the correct ports of the splitter. Red for microphone, green for your speaker. You may have also unintentionally denied the app the required microphone permissions. When you first launch the app it will ask you to give permission for it to use the mic, tap 'Allow'. If you accidentally deny this, you can open Settings, scroll to TrooperTalk, and reenable microphone permission. The voice processing should then work correctly. It may be possible that you are using an incompatible mic/splitter combo, make sure you are using only hardware recommended above. If you still aren't getting sound to your speaker, you will want to confirm that each part in the chain (mic, adapter, splitter, 3.5mm extension cables, amp, etc.) are all working properly. Try using another microphone to test if possible. I am getting feedback while using the app, what do I do? Feedback happens when the microphone picks up the sound from the speaker, which is then projected back through the speaker, thus creating a feedback loop. To minimize this, use a uni-directional or cardoid microphone like the one linked above, which only picks up sound from one direction. You may also consider disabling the 'Voice Static' option and lowering or disabling 'Radio Distortion' if you continue to experience issues. If none of these suggestions helps, please send a message using the form below. Depending on the volume of your voice, as well as the proximity of your microphone to your mouth, you may need to adjust the Voice Cutoff Threshold slider, which controls how sensitive the voice processing is to your voice volume. It's recommended to place your mic just grazing your lip, with the Voice Cutoff Threshold value as low as possible without it activating from breathing or other background sounds. Luckily in TrooperTalk there are lots of ways you can customize the sound and setup to suit your liking! With either one of the preset character profiles, or a custom profile of your own, you have the power to adjust and modify the emulation to a great extent! Adjust one setting at a time in small increments and don't forget to save your new profile for future use! If you still are not happy with the results you're getting, please send me a message with your feedback so that I can improve TrooperTalk in future updates. How much battery will TrooperTalk use? This depends a lot on your device, but on an iPhone 6 you can expect to use approx. 10% battery/hour when on Airplane Mode and using voice effects and background chatter. How can I leave feedback or ideas for future TrooperTalk updates? I greatly appreciate any feedback on TrooperTalk, good or bad. It's how I can improve the app and make sure that everyone using it has a great experience. Please send your thoughts and feedback to me via the form below! Can I emulate other characters not currently in TrooperTalk? Your question not answered here or have a feature request? Send me a message!